Tombs & Treasure was originally released in Japan as Taiyo no Shinden: Asteka 2 (太陽の神殿 アステカ2, , lit. Temple of the Sun: Azteca 2?). It is an adventure game developed by Nihon Falcom in 1987 for the NEC PC-8801, NEC PC-9801, Fujitsu FM-7, and Sharp X1 Japanese systems; a Famicom conversion was altered to be more story-based, and featured new music and role-playing elements. It was localized for the United States by Infocom for the NES in 1991. Enhanced remakes were released in Japan for the Sega Saturn and Microsoft Windows in 1998 and 1999, respectively. The game takes place in the ancient Mayan city of Chichen Itza on the Yucatán Peninsula. It alternates between using a three-quarters overhead view for travelling from ruin to ruin, and a first-person perspective upon entering a specific location. Several actual sites of Chichen Itza are explored by the player, although their interiors and purposes are altered in order to help create an atmosphere of fantasy and mystery-solving intrigue. Furthermore, each ruin is home to a demon that is said to be under the control of a creature known only as Tentacula, although this is only speculation that is gathered from the professor's notes and what José has to say to the player at the start. Tombs & Treasure is predominantly about solving puzzles and interacting objects with one another as they are found throughout the Mayan city. When travelling from temple to temple, the only available action is to walk using the D-pad. However, once a temple is entered, the player may start exploring much more thoroughly. Using a list of picture-based action keys ("Go", "Push", "Wash", etc. ), the characters can interact with the environment, inspecting it for clues and manipulating it to unlock another area elsewhere. There are several items to collect, as well, whose purpose can be learned by looking at them. The game also came packaged with a small guide which represented the professor's journal, it is written in an awkward cursive form and can be hard to understand, as well as speaking in riddles, but can often aid the player if read correctly. 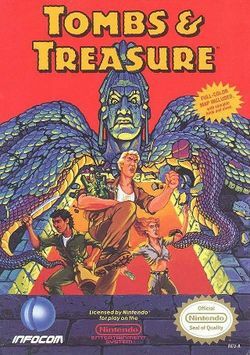 This game also happens to be the only console game that famous computer software publisher Infocom ever produced. This page was last edited on 10 April 2017, at 09:49.